At C64 parties, the tradition is to submit the music as an executable file which may include some simple visual effect. 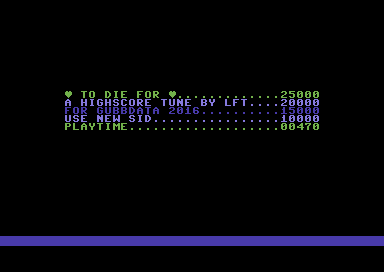 In this one, the playing time is displayed as minutes-seconds-hundredths, and that entry rises through the ranks until it ends up at the top when the song ends. Here's my contribution to the C64 music compo at Gubbdata 2016. It's in the style of a highscore ballad—hence the name—and it ended up on 4th place. Here's the CSDb page for To Die For.